Tathiane Mallett moved to the United States from Brazil with her husband, leaving behind close friends and family. She went through a 30-hour labor without an epidural or anesthesia and gave birth to a beautiful girl named Olivia. She then moved from Michigan to Gainesville when her baby was only 2 weeks old. After so much hardship, Tathi was convinced that breastfeeding, at least, would be easy. She found it to be quite the opposite. 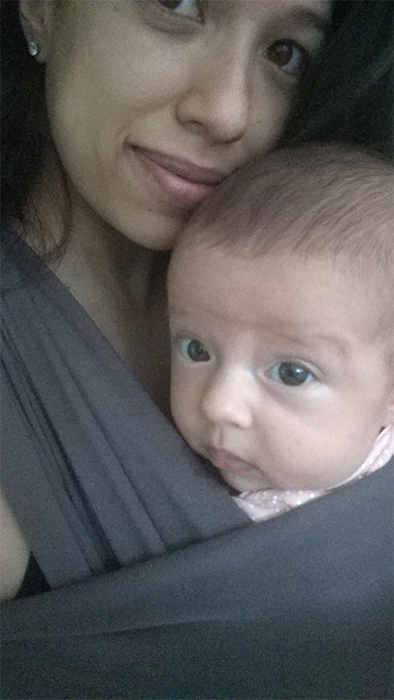 While in the hospital after Olivia’s birth, Tathi experienced extreme discomfort during breastfeeding. Her mother, visiting from Brazil, assured her that soon she would get used to the feeling, and the pain would go away, just as it had for her sisters. By the time Olivia was 6 weeks old, however, she was still fussy during breastfeeding and was barely gaining any weight. Tathi was very concerned. “I was getting quite frustrated. I kept thinking, ‘What am I doing wrong?’ ” Tathi said. Tathi went to see Mary Ryngaert, a lactation consultant at The Center for Breastfeeding & Newborns, within the department of pediatrics at UF Health, carrying a video of her breastfeeding technique. There, Olivia was diagnosed with tongue-tie, a congenital condition in which tissue connects the tongue to the floor of the mouth, making it difficult for a baby to latch during breastfeeding. After a small procedure to fix the tongue-tie, Olivia began breastfeeding normally, something Tathi describes as nothing short of a miracle. Post-procedure, however, Tathi had to re-learn how to breastfeed, as she’d grown so accustomed to nursing a baby with tongue-tie. When latching was still difficult, Ryngaert recommended that Tathi join the UF Breastfeeding Support Group. The UF Breastfeeding Support Group is made up of moms and moms-to-be, as well as a lactation specialist. There, women can voice their questions and concerns about breastfeeding in a tight-knit supportive environment. For Tathi, it meant a lot to have both breastfeeding moms and a specialist in the same room, giving her a perfect mix of personal support and professional advice. Continuing to breastfeed was important to the new mom for both personal and cultural reasons. According to Tathi, women in Brazil are judged much more harshly if they choose not to breastfeed as compared to in the United States. Tathi felt that pressure, even as far as she’d come from her home country. However, the physical experience of breastfeeding in Brazil is also entirely different than in the U.S. In Brazil, breastfeeding publicly is deeply accepted, while in the United States, women are expected to cover up and breastfeed privately, a style of breastfeeding that Tathi describes as lonely. The cultural deviation is evident even in the recommendations for time spent nursing. In Brazil, women are expected to breastfeed for an hour each session, but Tathi found that this meant that breastfeeding took up the vast majority of her day. After attending the UF Breastfeeding Support Group, Tathi discovered that American breastfeeding recommendations differed greatly from those in Brazil, with American guidelines recommending shorter feeding times, among other concepts that Tathi describes as more practical. Tathi still struggled, however, to reconcile the differences between the culture she’d grown up with and the one she was becoming a part of. “It was really confusing because it was like, should I follow my culture? Should I follow the one I’m in now?” said Tathi. Tathi eventually chose to follow American recommendations and is successfully breastfeeding Olivia. She owes that success, she said, to both her lactation specialist and the UF Breastfeeding Support Group, which allowed her not only to overcome her breastfeeding difficulties but also to connect with other moms in the same circumstances. Now, even when having a difficult day or nursing session, Tathi knows that she can.